Lindsay Pomeroy has been teaching about wine since 2006 when she founded Wine Smarties, San Diego's first wine education school. Always improving her own skills, she is actively pursuing the Master of Wine title. Full of pizazz and endless ideas, she adds sparkle to the world of wine. WSET Level 2 Certification in Wine and Spirits: The WSET Level 2 Certificate is designed for those who have little to no previous knowledge of wines and spirits. The course is also appropriate for those not employed in the industry but have a serious interest in wine or spirits and wish to broaden their knowledge in a structured way. It is a 16 hour program taught over 5 classes with a exam on class 6. We cover the main grapes, regions, styles of wines around the world. You will improve your ability to taste and understand labels. French Wine Scholar Certification Program: The French Wine Scholar program is an official certification course of study designed by the French Wine Society to provide current, accurate information on the wine regions of France and validate proficiency in the Wines of France. It is endorsed by Wines of France/French National Wine Office and is taught by licensed French Wine Scholar Instructors. Wine professionals who follow this in-depth curriculum on the wines of France and pass the exam, earn the French Wine Scholar (FWS) post-nominal. Trend Spotting: Tasting through the Global Wine Trends: In this class we will be tasting through the most pertinent global wine trends; sparkling wines, roses, red blends, “terroir” wines and more. We will discuss the global wine consumer while determining which trend will stick and which won’t. Costs $40pp. When I first to moved to San Diego after living abroad teaching English in Italy, I took a job as a wine salesperson and fell in love with it. The wine that turned me into a wine enthusiast was a German Riesling from the Nahe. I loved the purity and intensity of the style, which I still covet today. Learning about the world of wine has been equal parts humbling, challenging and exhilarating. I wouldn't trade it for the world. Lindsay Pomeroy offers private wine classes and wine events to consumers. In addition, the wine certification courses offered are open to the general wine enthusiast. Lindsay Pomeroy has been teaching wine classes, certification courses as well as running wine events for over 10 years in San Diego, California. Her career in wine really began when she was hired as the Manager for the original Wine Steals in Hillcrest. It was there that she realized the general public was thirsty to expand their understanding of this complex, elusive beverage. She sought to quench their thirst by founding San Diego's first wine education company. Through wine events, wine classes, and certification courses, the Wine Smarties vision was and still is to help enthusiasts everywhere improve their understanding of the world of wine. 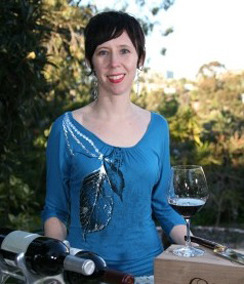 As the first and exclusive instructor for both the WSET (Wine and Spirits Education Trust) and French Wine Scholar certification programs for San Diego, Lindsay has helped her students achieve their personal dreams and goals in the wine industry, which has had the surprising consequence of improving the San Diego wine scene as a whole. Lindsay Pomeroy tailors private wine classes to corporations and individuals alike, ensuring that the client's needs always come before her own in customizable classes. In addition, Lindsay organizes and manages both small and large scale events. Most notably, she helped create the Annual Cheese, Chocolate and Wine Festival with the Women's Museum of California, now an 800+ person sell-out event. In addition to classes and events, Lindsay has many years experience working as a Wine Director in restaurants and wine bars alike, again putting the customer's needs before her own to ensure complete satisfaction. Lindsay has also been a contributing writer for San Diego Magazine and through her dynamic and far-reaching vision, was nominated as a finalist for the Magazine's "Women Who Move the City" in 2009, 2010, and 2011. Finally, in her tireless quest to be the best she can at what she does, Lindsay has sat the 4 day Master of Wine exam in June 2015 passing the grueling theory portion and plans to expand her reach when she becomes San Diego's first and only Master of Wine (2017) by offering more courses and publishing her perspective on the world of wine.